Bakersfield is a great town, but we did not get a chance to see a lot of it. We had a late start (odd for Goldmans, I know), a long way to go and a short time to get there. 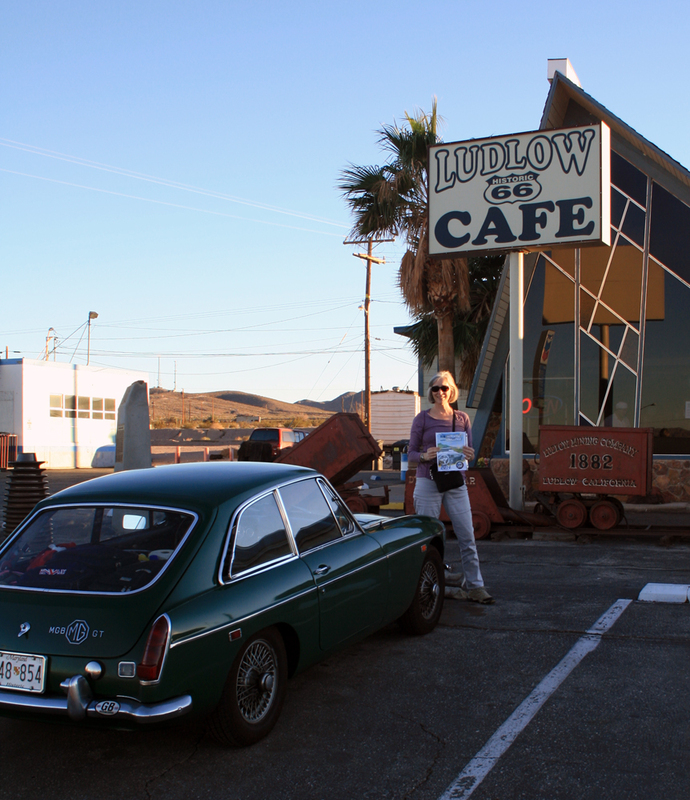 However, we did secure a superb Moss Motoring Challenge photo in Bakersfield. The Fire Station is right next to the town’s administrative offices. 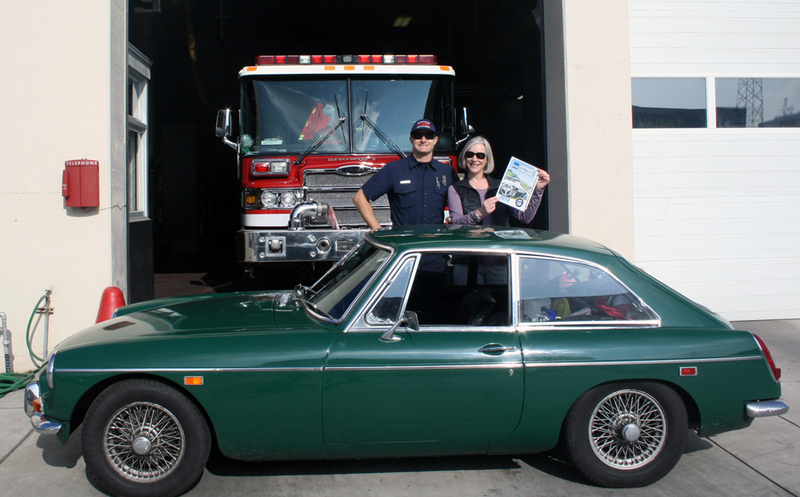 The Chief of the Fire Department kindly allowed us to take a picture of an engine as long as the town emblem was not in the picture. The guys at the station pulled the engine out into the sun for us. And although there’s no emblem on the truck, there is a fireman in the photo! A girl cannot resist a man in uniform. We headed east, as we will be for the next week or so. 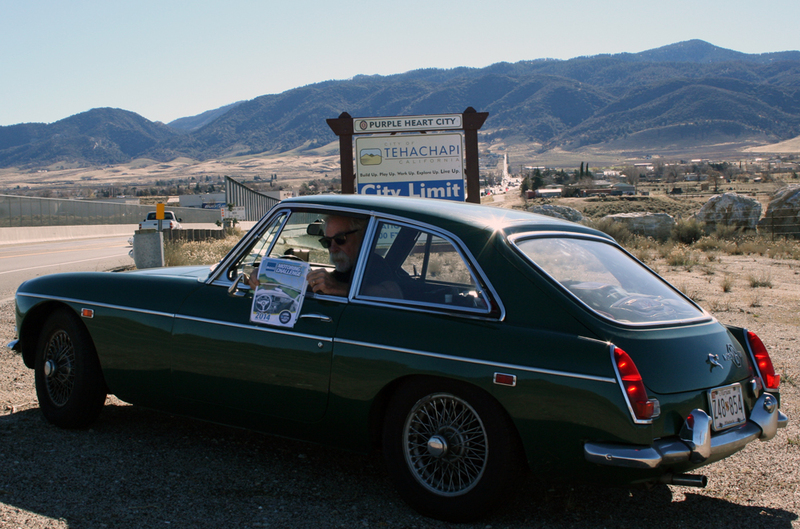 Had to stop soon to pick up a photo in Tehachapi because we are still willin’. Thanks go out to my partner, Tom Minton, for that suggested stop. 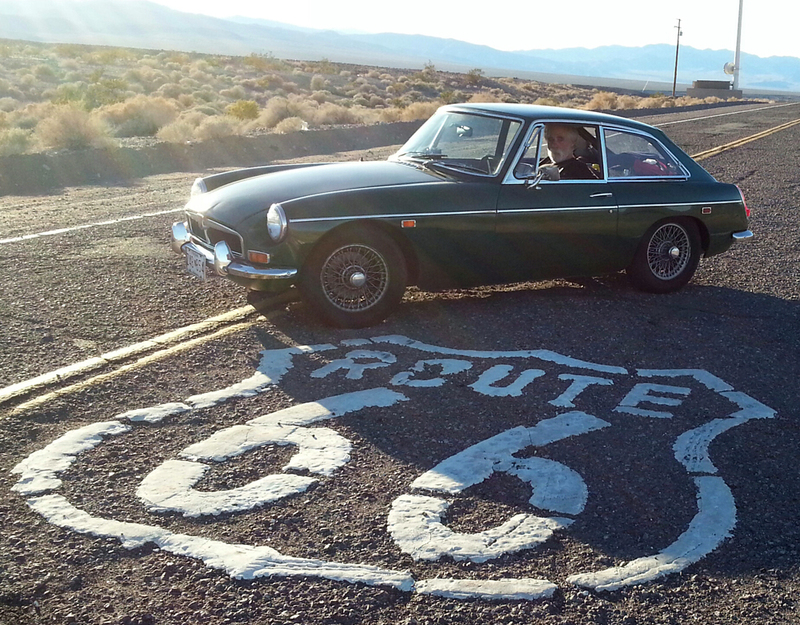 We planned our route through Bakersfield specifically so we could touch a wheel on Route 66. And touch we did. Take a look at the surface of the road in the picture. Driving on that section of Route 66 should have been considered an off road experience. Our little girl seemed to take it with good humor as she bounced over the cracks and ruts. We slowed to about 5 MPH so as not to rattle her parts off. There was an eight mile section of torture before we could slide back onto Route 40. We would learn later that she did not fare as well as we would have liked over that stretch. Route 40 replaced Route 66 in this part of the world. A lot of what is left looks much as you would expect. The historic highway dips back and forth, under and around for miles. We stopped to refuel and picked up an “L” for the challenge. 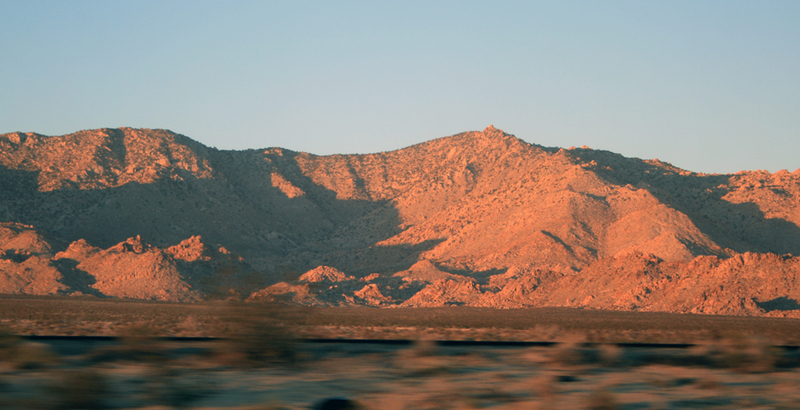 Back on Route 40, we headed into the Mojave Desert where we watched the sun sink behind us. We had many miles to cover after the sun went down. We saw the London Bridge in Lake Havasu City all lit up for Christmas. Through the darkness into Phoenix, arriving just before midnight. Stats on the day: 503.4 miles, 20 mpg. I’m drafting this post on the iPad cruising along I-10 on our way to El Paso. So the little green one took some licks gettin’ kicks on Rt. 66? Let’s just say she got herself a little pinch. I’ll report tomorrow with further details. Mmmm, I think you meant “Mojave” Desert. 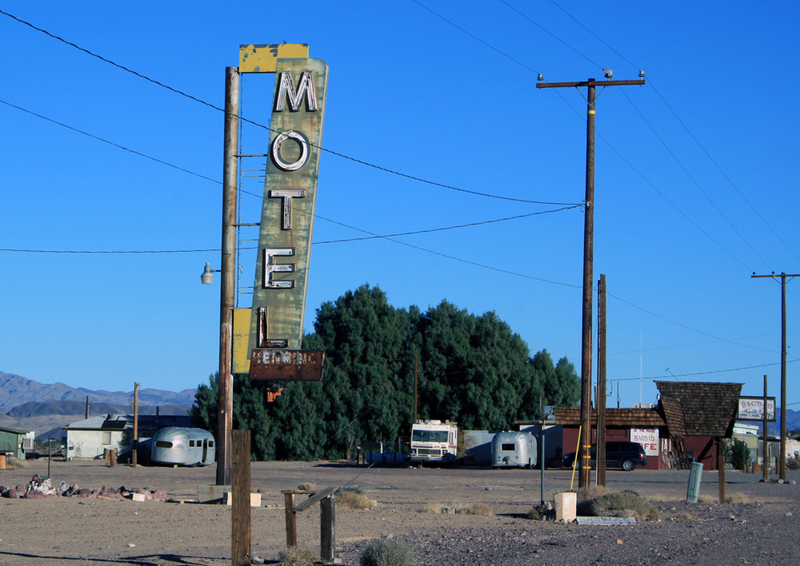 Beautiful pics – brings back many fond memories out West and on other long distance road trips.